How to become an instructor and teach your own course for Medical Spa MD. Share your clinical skills, expertise, and knowledge with clinicians, clinics and practices around the world. Your clinical skills and business savvy are unique and valuable. We'll help you build a beautiful course to share your knowledge, and be rewarded for it. We're happy with any response. We're just looking to see where we are in the process. My course is already done and I can add it to your system. I want to build a course from my existing presentation, lesson, or training. I have an idea for a course. Tell us why you're an expert in this subject. Your message has been sent and you can expect a response within a day or two. Everything you need to power your online course. Do you have clinical skills, marketing-ninja-know-how, or business savvy? Or did you discover something through trial-and-error that others would want to know? Do you want to share those skills and knowledge? Would you be interested building your network, gaining a new revenue stream, and skyrocketing your name recognition and personal brand? Medical Spa MD University is everything you need to create and deliver your course to clinicians and medical practices around the world. Create your lessons just once, and you're in front of a world wide audience with courses that are always on and available. Build a new income stream, or a raging income river. People want to learn what you know and they'll pay you to teach them. Think of us as your very own IT department, design agency, marketing team and publisher. And because we work on a publisher model, it's all free for you. You're half-way there already. Use your existing presentations or trainings as an easy way to start. We'll help you repurpose your content, build your course, and find an audience. This isn't our first rodeo. We've been training clinicians online for years. We know what success looks like, and what it takes to achieve it. We've had amazing successes and we've learned from our occasional missteps. The result: a proven system that guides you from A to Z. And because we're only successful if you are, we'll work hard to ensure that success. You'll be using best-in-class technologies — the same technologies used by universiteis and Fortune 500 companies. You build a great course. We'll handle everything else. We've been working with physicans and clinic owners online since 2002. We know what it takes to make a sales page hum, and what's a waste of time. Another brilliant benefit: your own support team of designers and editors who will make sure you look good. So when you publish your course you'll be be a proud parent, eager to share your new creation with the world. Whether creating a single five minute "how-to" lesson or you're building a deep-dive clinical training, we'll hold your hand through every step and decision. You'll have access to everything you need and you'll always know what to do, saving you headaches and dead-ends. We've solved the biggest challenge that's been holding you back: Getting in front of interested buyers. We'll put your course in front of clinicians and businesses who are anxious to find information that solves their problems. And if we don't know how much demand their is, we'll ask our Members and find out. So, you'll never risk building a product or course that no one is interested in. We're in this together. As part of our community, you'll benefit from every course, classified ad, blog post and email we send to a fast-growing and targeted network. That means that you're immediately exposed to a massive, world-wide group of potential buyers. Every part of your course will run automatically. Take email for instance. Your course will include custom subscripton forms, auto-responders, drip campaigns, login reminders, coupons, cart abandonment, incentives, and support communications. And that's just where we get started. Sometimes the best things really are free. If you have a guide, resource, or presentation that you want to make available for free, we're happy to help if it fills a need with our audience. If you have a presentation you have a head start. You've already built the outline for your new course. Add a little time and elbow grease and your presentation will be available to a massive new audience. Questions? Here are some frequent answers. Why should I build an online course? Scale yourself and join the digital age. It's kinda like writing a book - but not as much work. Influence: Be recognized as a thought-leader in cosmetic medicine. You'll have access to a microphone that allows you to punch way above your weight class. Visibility: You'll be seen. Medical Spa MD has a large, loyal following of clinicians and it's growing quickly. Your Own Byline: You own all of your content, and can use it on your own site or to teach your own courses elsewhere. You'll be paid: We work with a publishing model and you'll get a percentage of every sale. You can, if you have expertise that's of interest to our audience. Our courses are designed to solve specific problems. If you can teach someone how to do something or solve a problem they have, we'll help you do that. Do I have to be a physician to be an instructor? No, but many to our instructors are. You do have to be experienced and have information that's relevant to physicians and clinicians in cosmetic medical settings. Does it cost anything to be an instructor? No. We're in this together. Can I teach under a pseudonym? Yes, if you feel it's necessary. There are cases where someone may not want to be directly identified for any number of reasons. If needed, we can create a pseudonym in order to prevent an authors identity if they're in a situation where disclosing their identity could cause professional or business harm. What can I or should I teach? That's pretty easy. 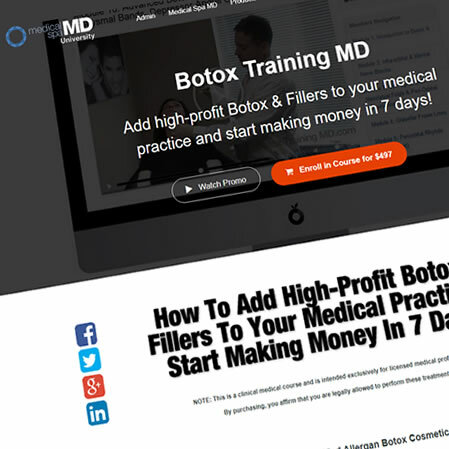 Our audience is physicians and clinicians working in cosmetic medicine around the world. Your course should be of interest to that audience. Create something hyper-specific that is valuable. The step-by-step detailed procedures that you've built to keep your patients ecstatic and coming back? How to perform a new threading treatment? Patient review marketing for your front desk? Those are interesting. Teach something that you know, feel, or think that almost no one else knows, or agrees with. What do you know now that you wish you knew a year ago? That's where you'll want to start. Specific marketing tactics that work. Yes. In fact, we'll help.